The relationship between alcohol and depression is deceptive. Since drinking is often a part of social gatherings, it may seem like a few beers would be a great way to take your mind off your troubles. However, alcohol can actually worsen depression symptoms. In some cases, it may even induce depression in someone with no previous signs of a mental health disorder. Despite being one of the most common mental illnesses, depression is often misunderstood. Clinical depression is more than just having a bad day once in a while. Someone suffering from depression experiences noticeable changes in mood and behavior that significantly affect their overall quality of life. Symptoms that occur on all or most days for two weeks or more indicate a need to consult a medical professional. Studies indicate that nearly 1/3 of people suffering from depression also have a drinking problem. 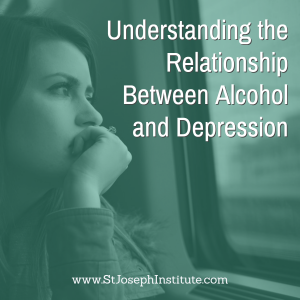 The link between depression and alcohol addiction is strongest in women and teenagers. Chemically speaking, alcohol is a depressant. A depressant is a substance that lowers neurotransmitter levels, reducing stimulation and arousal in the body. The majority of people who suffer from both depression and alcohol addiction began drinking as a way to self-medicate their symptoms. However, since the genetic risk factors for both drinking and depression significantly overlap, alcohol abuse can sometimes trigger symptoms in people who weren’t previously depressed. Fatigue. Drinking regularly can negatively affect your sleep patterns. Fatigue can worsen existing depression symptoms or trigger symptoms in people who are not clinically depressed. Difficulty regulating blood sugar. When the liver’s resources are devoted to processing alcohol, it becomes more difficult to maintain stable blood sugar levels. This can lead to mood swings, including feelings of anger and irritability. Folic acid deficiency. Folate deficiency is common in people suffering from depression, but regular alcohol use lowers levels of folic acid in the body. Lower serotonin and norepinephrine levels. Alcohol can lower levels of these important mood regulating chemicals in the body, which can make a depressed person feel more depressed. Impaired judgement. Alcohol decreases inhibition and impairs judgement. This can lead to risky behaviors, including self-harm or suicide attempts. Someone who is suffering from both depression and alcoholism is said to have a dual diagnosis or a co-occurring disorder. In this case, both illnesses must be treated simultaneously. This is typically done with a combination of individual therapy, group therapy, and medication to focus on relieving specific symptoms and addressing the underlying factors contributing to both problems.